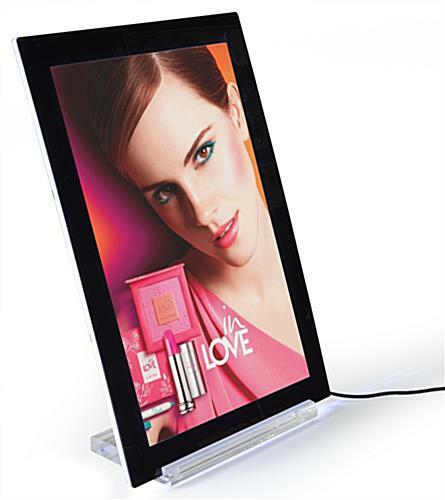 This Lighted Pictureframe Turns 11x17 Images into Illuminated Ads! This Counter Fixture Has A Separate Base Withs A Small Footprint! 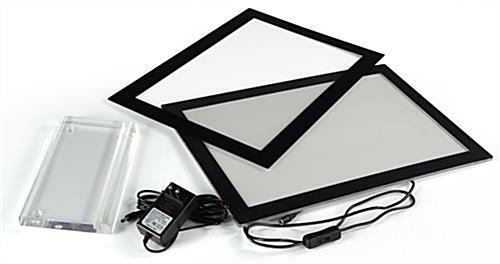 This Lighted Pictureframe Is In Stock Online For Immediate Order! Counter or table-top stand has small footprint but supports 11x17 graphics in either portrait or landscape orientation. Energy efficient LEDs cost less to operate than non-LED lightboxes. Illuminated picture holder can be used with menus or pictures printed on any type of paper. This lighted pictureframe has brilliant LED backlighting that turns 11" x 17" prints or menu printed on any paper into illuminated marketing. 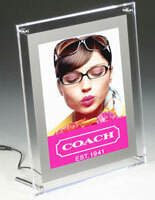 This sign frame holds graphics securely between two magnetic acrylic panels so swapping images is fast and easy. 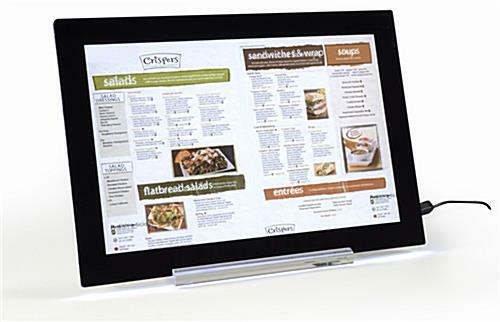 Each economical menu display, low-energy lighted pictureframe provides visual contrast with a bold black border on the front. Each 11" x 17" graphics enclosure has a free standing clear acrylic base that supports either horizontal or vertical displays. Each energy efficient LED lighted pictureframe, sometimes called a backlit illuminated sign holder, is a superior choice for restaurants or stores that want to highlight their ads or menus without the expense of traditional light-boxes. 19.3" x 14.0" x 5.3"